The goal of this post is to provide you with actionable research tips for finding content ideas. While my agency provides SEO services for the professional services industry, I think brands in any industry can benefit from this information. But, as an SEO, I have learned it is not all about keyword rankings; it is about the traffic generated from keyword targeting and the resulting high rankings in the SERPs. You are not ranking for your client's desired keywords, and need traffic now so you can report some good news. You have achieved your client's keyword ranking goals, but your traffic has started to stagnate, and you need to increase it. Take a broad view of your industry. gives you a list of related and suggested searches for terms. This will give you a very long and thorough list of very broad "unfinished” topics you can pick and choose to consider writing about. I like this technique because it’s the first step of creating objective content, meaning these are topics you can be assured real people have searched for. So, whatever content you choose to create, you understand the purpose is to create something that is going to help your customers. In my example, I pull a broad term from my table under electricians. The term I use is "light switch." Naturally, because this is a broad term, you are going to get a huge list of suggested searches. 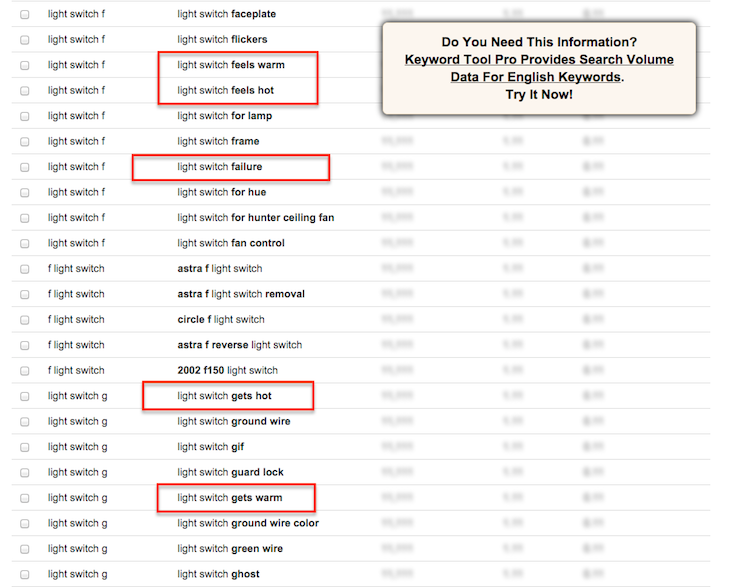 Go through this list and pick out the terms you think will get searches or that seem like a FAQ type of query. 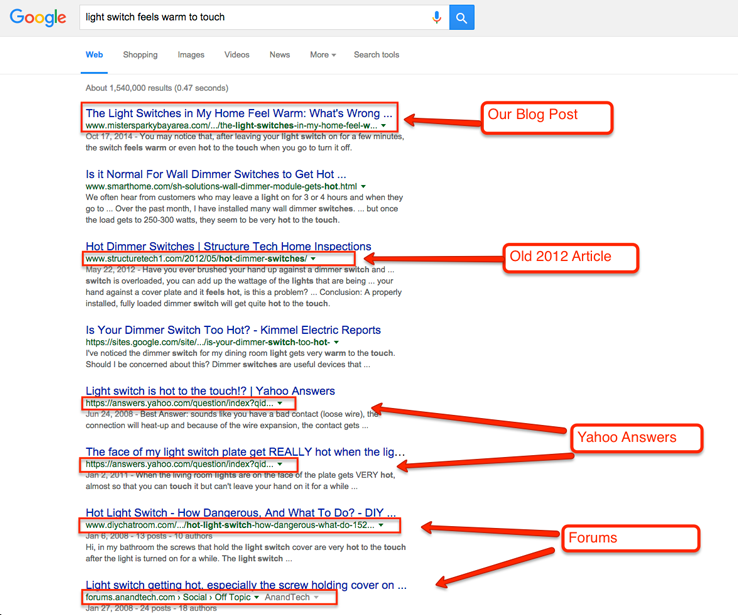 Near the middle, I pull the suggested search term by focusing on "light switch feels warm” or "light switch feels hot.” This one looks like a winner, and I believe it is something everyday people search for if they suspect a problem with their electrical wiring. You can take this a step further by taking the longer suggested term you just discovered and putting it into Keywordtool.io. The second group of results gives me more detailed suggestions. At this point, you have an interesting idea to write about, or multiple ideas if you enjoy thinking ahead. Now we are going to run our searches through Google to examine the competition of the long-tail keyword content idea we are considering. Call on your content person (or team) to write an even better article composed of all the elements you think make the other post(s) successful. I have found instant success using this method to rewrite service pages as well. Every successful, high-ranking post has something other articles fail to mention. Make this the starting point for your new post. As a result of following the four-step process described in this post, I have experienced a good amount of success, and my site's organic traffic shows it. The traffic shown here was for a blog post that I created using the same process. The two images below are from the same content piece, but show up differently in two separate queries. I've walked you through the rough outline of the process I use to create content. I hope this strategy will be of great help to you, too, especially if your goal is to regularly create content on a limited budget.